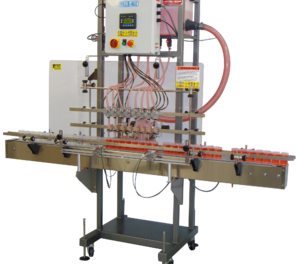 The Fills-All Model ECF-G portable single head gear pump filler comes complete with an all stainless steel enclosure, product supply gear pump and one nozzle with a fully adjustable nozzle rack and electronic controls. Special models available for special filling applications. Please inquire for assistance. All free flowing corrosive products. - Air: 1 cu/ft per min. 90psi.